Grading in civil engineering and construction is the work of ensuring a level base, or one with a specified slope, for a construction work such as a foundation, the base course for a road or a railway, or landscape and garden improvements, or surface drainage. The earthworks created for such a purpose are often called the sub-grade or finished contouring. 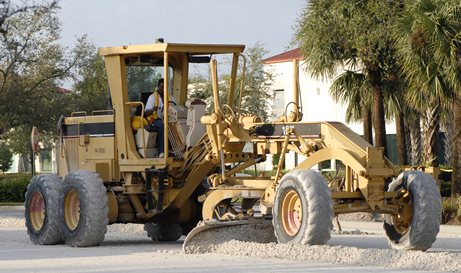 In the case of gravel roads and earthworks for certain purposes, grading forms not just the base but the cover and surface of the finished construction, and is often called finished grade. In the environmental design professions grading is a specifications and construction component in landscape design, landscape architecture, and architecture projects. It is used for buildings or outdoor amenities regarding foundations and footings, slope terracing and stabilizing, aesthetic contouring, and directing surface runoff drainage of stormwater and domestic/irrigation runoff flows.